I dare you to listen to Michael Franti’s new song “Once A Day” and not feel inspired, uplifted, and restored. The video is filled with people from all walks of life—the disabled, LGBT, old, young, black, brown, white—with one thing in common: They all embrace their place in the world community. STAY POSITIVE : Michael Franti will spread his good vibes at the inaugural Food Truck Festival on Aug. 14 at Avila Beach Resort. “Everybody oughta hug somebody, at least once a day./ And everybody oughta kiss somebody, at least once a day./ Everybody’s gonna miss somebody, at least once a day./ And everybody gotta love somebody, every day!/ And we all will rise up! (Spread your wings and fly)/ And we all will rise up!” Franti sings. This Friday, Aug. 14, Michael Franti & Spearhead bring their “Once A Day” tour to Avila Beach Resort (doors at 5 p.m.; $20 to $30; ticketfly.com) with Wheeland Brothers, Moonshiner Collective, and Zongo All-Stars opening. Oh, and it’s also the inaugural Food Truck Festival. Sweet! Franti gave New Times a ring between concert dates to talk music and politics—two things that have been central to his life since his first industrial band The Beatnigs (1986 to 1990). I first heard him when he formed the hip-hop act The Disposable Heroes of Hiphoprisy (1991 to 1993), and I’ve always thought his politics were one of the most compelling elements of his long career. What are his biggest political concerns these days? For those following the upcoming election, the political landscape looks pretty bleak, but Franti tries to take a broad view. Does he know whom he’s voting for? “I’m for 100 percent renewable energy for 100 percent of the nation. What are the ideas that can get us there?” he asks. He’s been advocating for social justice for nearly 30 years. Are things getting better or worse? He’s clearly an optimist, but does he ever get down? Franti has a particular vantage point from which to see race relations in our country, mainly because of his complicated mixed heritage. 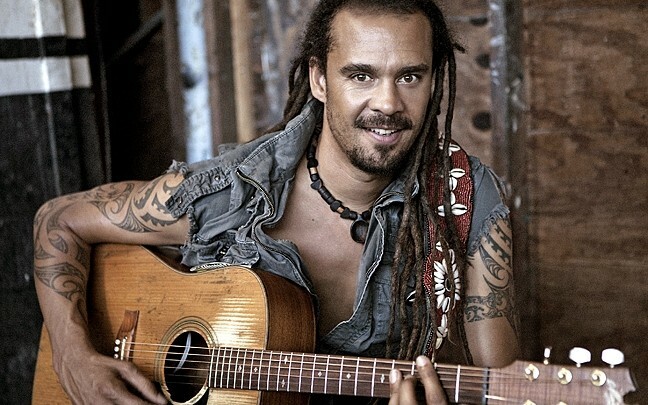 Recently, Franti has been looking into his biological parents’ family history and discovered his grandmother’s grandfather lived a traditional Native American life in the mountains of Virginia and that his grandmother’s grandmother was a slave until she was 12. The robe is cool and all, but celibacy? I think Franti’s path of spreading joy and enlightenment through music is probably a path he’s better suited to. 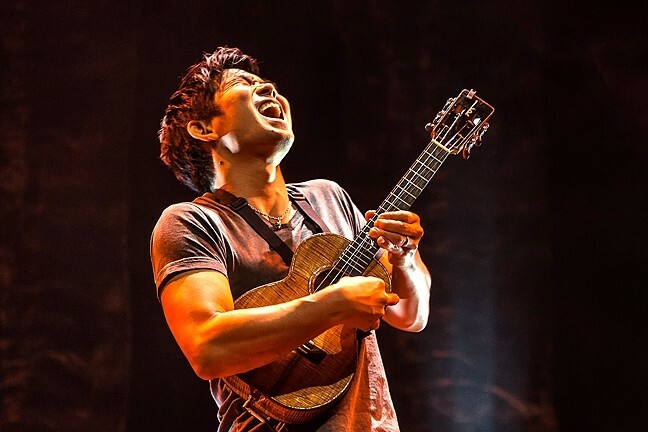 FOUR-STRING WONDER : Ukulele master Jake Shimabukuro plays the SLOPAC on Aug. 15. What Bela Fleck did for the banjo, Jake Shimabukuro has done for the ukulele, taking the instrument where no one before dared to go. The dude shreds, and the fact that he’s returning to the area this Saturday, Aug. 15, to play the Performing Arts Center at Cal Poly as part of an encore Cal Poly Arts and Otter Productions Inc. concert shows just how many fans he has on the Central Coast. The ukulele is synonymous with Hawaiian music and culture, having arrived there via Portuguese sugarcane workers and since adapted with influences of island folkloric, European music, and Spanish guitar. Shimabukuro mixes these and other sounds to create complicated arrangements that drift into spontaneous improvisation. Melodic, incendiary, and captivating—it’s music unlike anything you’ve heard on the ukulele. If you need more inspiration, check out the documentary Jake Shimabukuro: Life On Four Strings currently on Netflix. His concert starts at 8 p.m. Call 756-4849 for ticket info. FUNNY MAN: Known for his acerbic wit and offbeat comedy in his role on The Office, Creed Bratton will show his musical side on Aug. 14 at SLO Brew. 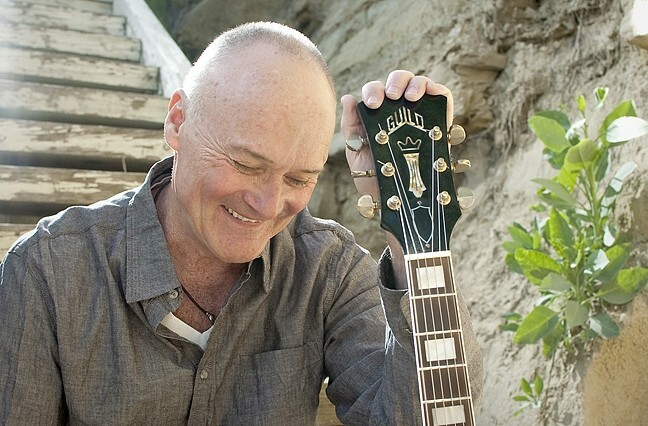 He appeared in small roles in films like Heart Like a Wheel, Mask, and Neon City, but he’s always been a musician, and since joining the cast of The Office, he’s released three solo albums: Creed Bratton (2008), Bounce Back (2010), and Tell Me About It (2012). This Friday, Aug. 14, at SLO Brew, Bratton plays a Good Medicine Presents and Numbskull Productions show that mixes his offbeat comedy and music (7:30 p.m.; 21-and-older; $15 presale or $17 at the door). Good Medicine also hosts killer funk act Captain Nasty on Friday, Aug. 14, during a free pop-up concert at Tooth & Nail Winery from 5 to 9 p.m. In addition, The Mighty Fine headlines SLO Brew on Saturday, Aug. 15, for a local punk rock showdown with Nothing Ever Stays, New Tomorrow, and Raise the Bear (7:30 p.m.; all ages; $10 presale or $12 at the door). MARLEY! 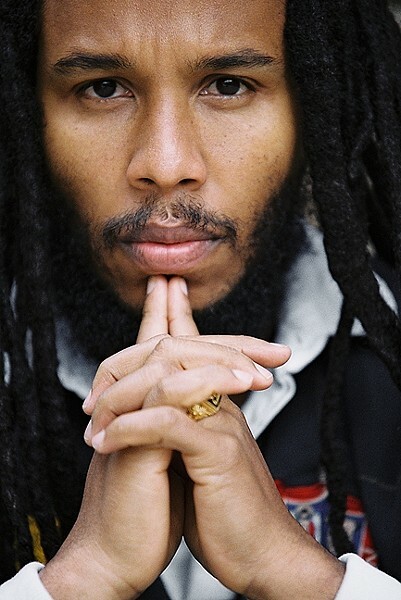 : Reggae superstar Ziggy Marley (pictured) headlines Vina Robles Amphitheatre on Aug. 14 with opening act Ras Danny & the Reggae All-Stars. Reggae legend Ziggy Marley plays Vina Robles Amphitheatre this Friday, Aug. 14 (7 p.m.; $39 presale or $45 on show day; vinaroblesamphitheatre.com). Ziggy, son of reggae legend Bob Marley, has long ago proven himself worthy of taking on his father’s mantle: He’s a seven-time Grammy winner, Emmy winner, great humanitarian, and amazing singer, songwriter, and producer. Opening will be our own local reggae heroes, Ras Danny & the Reggae All-Stars. Danny was raised in Trenchtown, Jamaica, and knew Bob Marley. He spends the bulk of his time in San Luis Obispo, but he still returns regularly to Jamaica to further his philanthropic endeavors of helping young people experience the joys of musicianship. Danny and his band—Antoine Richardson, Gavin Thompson, and David Gorospe—have backed Grammy-winning reggae legends Black Uhuru and Lee Scratch Perry & the Meditations. This is a don’t-miss show for reggae fans! 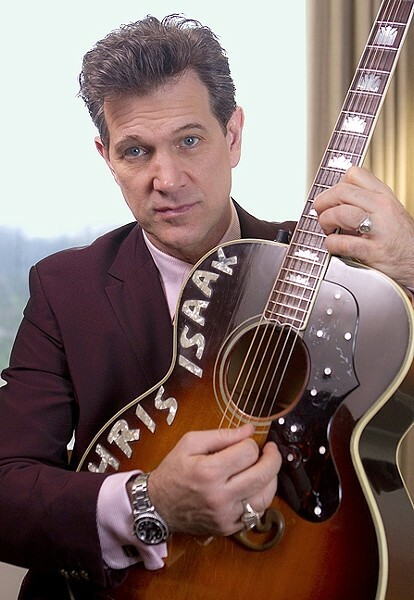 Also at Vina Robles, catch Chris Isaak on Saturday, Aug. 15 (7 p.m.; $45 to $70; vinaroblesamphinteatre.com). The Grammy-nominated singer-songwriter, musician, actor, and talk show host has a career spanning 25 years, and will perform songs from his entire catalogue. WICKED GAME: Rocking crooner Chris Isaak plays Vina Robles Amphitheatre on Aug. 15. Dread Daze brings their authentic reggae sounds to Frog and Peach on Friday, Aug. 14, at 9 p.m. The LA-based band makes forays into hip-hop and rock, and will appeal to fans of Tribal Seeds, Rebelution, Steel Pulse, and SOJA. Steynberg Gallery hosts Broadway song and dance man Gale McNeeley this Saturday, Aug. 15, at 7:30 p.m. He’ll be performing favorites from his 50 years of musicals with Betty Faas accompanying him on piano. The cover is $10. The Steve and Eydie Gormé tribute act featuring Mary Anne Anderson and Steve McCann comes to D’Anbino Cellars on Saturday, Aug. 15 (8 p.m.; 21-and-older; $15; 227-6800). The tribute opened last march to a full house in Cambria.